As some of you might know, I am training for the Bel Monte 50k in March 2016. This training period has not been an easy one with knee and back problems cropping up on a fairly regular basis. Through treatment, stretching, and specific exercises, the back problems have largely been eliminated. 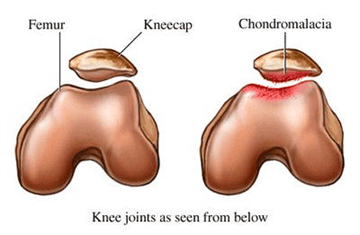 The typical effect of Runner’s Knee or Chondromalacia. However, on Thursday last week, my knee problems came back. It’s the typical “runner’s knee.” My left knee was injured pretty seriously while playing football in high school. Since then, I’ve had issues with it off and on. A training plan that sees me running up to 50 miles a week is bound to exacerbate those problems. This has been a setback in training as I missed a couple of long runs while resting my knee and waiting to let the doctor take a look. I still have nearly three months before the race but it’s tough when I get knocked off track like this. I have to remind myself that I am attempting this race to finish. I want to find my limit. If that limit is that I didn’t do every training run, then maybe that’s OK. The doctor told me this morning that my left kneecap was grinding against its groove and was improperly aligned. The pain in the back of my knee is from muscle spasms that occur when the knee is injured and is trying to protect itself. He then adjusted the kneecap in an effort to get it aligned correctly. He gave me a clean bill of health to continue training. So, physically, it would seem that I’m on the mend and the doctor gave me tools to prevent and treat this issue if it comes back. That’s all good news. The real challenge becomes the mental side of having an injury. The problem is that I no longer trust my body to do what I ask of it. I don’t have a solution to this problem. My approach is to be consistent and on target with my training plan. I plan to be attentive and diligent in doing the exercises I’ve been given to avoid re-injury. Past that, I know there will be lingering doubts and I know I probably won’t push myself as I was before. Maybe time is what heals us physically and psychically. This is when having a good training partner would likely come in handy. Someone who could provide motivation to show up for training runs and not let things slide. Someone who would encourage me not to cut a run short. I’ve been a solitary runner since I started this journey a few years ago. Maybe it’s time to change that.